Need a New Location for Your Healing Rooms? This is a Must Read! 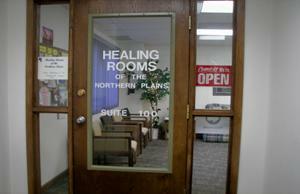 For many months we had been praying about a different place for the Healing Rooms of the Northern Plains. We dated a piece of paper and wrote specifics on it. Here are some of the things we specifically asked for: four or more prayer rooms, a soaking room, easy parking with a parking lot, handicap accessibility, a book room, rent with favor on the amount, a Christian landlord, and a war room that doesn't open to the waiting room. We looked at a building for sale in February 2007. Nothing happened. We continued to pray each week individually and as a Team. I wondered when things would develop. The date on our request paper was 2-2-07. A baby is born in 9 months. Would it take that long? Prophetic words were said about October being a month of surprises. Would we be surprised? I received prayer at the Healing Rooms in Beulah one July day. The team gave encouragement from the Lord. They said, "The key is in your hand." Knowing that God had a place for us, I shared this with our team and purchased a large key to hang on our War Room wall as a prophetic symbol. We kept praying and thanking God for the next place. We attended the Spiritual Hunger Conference in Spokane in September '07. While there, I attended the workshop put on by Mark Walker about Market Place Ministry. I was much encouraged and started praying for not only a Christian landlord, but one who knew about Healing Rooms, believed in what we were doing, and would want to have us in his building. One day in October the verses in Matthew 6:7-8 spoke to me in a new way. We had been asking for a new place (and you will receive - the key is already in our hands), but we hadn't been looking. The Lord said, "Seek, and you will find." After finding we then had to knock - this is the hard part because it meant asking favor with rent payment. So, we made an appointment with a realtor. Did the month of October have a surprise for us? October 26th did! To our surprise the place we thought would work was owned by the Christian attorney who helped the Healing Rooms in Bismarck be incorporated. This attorney had gifted us his work five years ago, AND his son received a healing to his back after prayer at the Healing Rooms! He knew about Healing Rooms, believed in what we were doing, and was a landlord of this building! We visited with him, told him our whole story, and he had 'God stories' to tell us about how he acquired the building. He worked out the details for the Healing Rooms to rent a suite at his building. And the amount we wrote on the paper in February was the amount he agreed to! October had a surprise, and November had a new birth for the Healing Rooms. We had the keys in our hands in November! We were given so much favor. We could move in before paying rent. The move started in December, and we opened at our new location in January 2008. A new beginning for a new year. We praise our Heavenly Father for all He has done! His Word is true. Ask, seek, and knock. Knocking was the hard part, but the door was opened! We praise Him! May many other Healing Rooms find favor with Christian business partners to further the Kingdom work. Since then reports have been coming in of at least three other Healing Rooms that have been offered buildings, FREE! Recently Jean Whitstone, Director of His Healing Rooms in Greater Milwaukee, Wisconsin, told us of the fabulous 3,000 square foot office space that has been offered to them to use at no cost to the ministry. The owner of this building had previously agreed to allow them to use the office space for a rummage sale. During the sale which went on for four months, they prayed with many people to receive salvation and healing. The owner heard of the miraculous and powerful healing testimonies taking place in her building and freely offered the building to Jean if she would open Healing Rooms there. Step out in faith, you don't know what the Lord will do and who will be watching!